Hey Readers, are you keenly seeking for the Arunachal Pradesh PSC Assistant Professor Recruitment 2018? So, we have exciting news for those contenders who want to make their future bright in the newest government job in Arunachal Pradesh Public Service Commission. Here, we are going share all the information regarding the Arunachal Pradesh PSC Vacancy 2018. This is the golden chance for those contestants who want to do a work in Arunachal Pradesh Public Service Commission then they must look up this given post & collect all the vital details from here & then they may apply online for this notification from the official website of Arunachal Pradesh Public Service Commission that is www.appsc.gov.in. For more details contender can bookmark our careerjobs360 page and stay in touch with us for further purpose. 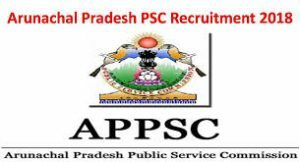 Arunachal Pradesh Public Service Commission has revealed the official notification for Arunachal Pradesh PSC Vacancy 2018 to recruit skilled & dynamic aspirants on 62 Assistant Professor Vacancies in the department. Interested and eligible Individuals can apply online for Arunachal Pradesh PSC Assistant Professor Application Form 2018 on or before the closing date that is 2nd July 2018. The desired individuals may check all the details related to the through the official web portal that is www.appsc.gov.in. Moreover, related to the APPSC Assistant Professor Notification 2018 such as age criteria, academic qualification, Important Dates, Selection Procedure, Result, etc., can be seen by scrolling down the mouse button. Academic Qualification: Interested candidates must have Good Academic record at least 55% marks at the Master’s Degree level in relevant subject from an Indian University or an equivalent degree from an accredited foreign University/Institute. However, there is a relaxation of 5% marks for the ST/ SC aspirants.. For more details contenders can visit the official notification of the Arunachal Pradesh Assistant Professor Recruitment 2018. Maximum age limit is 32 Years old. Age relaxation is applicable for the reserved category as per the govt. rules and regulations. For APST Aspirants – Rs. 100. For non –APST Candidates – Rs. 150. Selection Procedure: Selection of the aspirants will be completed on the basis of their performance in the following level of selection which is going to be organized by Arunachal Pradesh Public Service Commission. Pay Scale: Shortlisted aspirants will get the attractive amount of pay band as per the posts which is given in the official notification of the vacancy. How to Apply For Arunachal Pradesh PSC Assistant Professor Recruitment 2018? The interested and skilled aspirants must check the eligibility criteria before filling the online Arunachal Pradesh PSC Assistant Professor Application form 2018. After that, applicants can download the online Application Form from the official portal of the Arunachal Pradesh Public Service Commission on or before the closing date that is 2nd July 2018. Here, we have mentioned some steps to apply for Arunachal Pradesh PSC Notification 2018 in an easy way. Firstly, contenders have to access the official portal of Arunachal Pradesh Public Service Commission that is appsc.gov.in. Then, go to the “Homepage” and search out the Arunachal Pradesh PSC Assistant Professor Recruitment 2018 Notification Link. After that, hit the relevant link of the recruitment notification and open it in the next page. Then, Read all the instruction from the official notification very carefully before applying for the recruitment. Now, fill the application form with all the accurate information. Attach all the needed credentials with the application form. Upload the passport size photograph & signature on the registration form. Take the print copy of the application form and keep it safe for further use. At the end, submit the application form by click on the submit tab button. Prepare and Crack Your SSC Exam to achieve your dream job!